Take your Form 6 to the Voter Facilitation Centre (VFC) of your Assembly Constituency (AC). Even though your wards may have changed after delimitation, your constituency remains the same. Each AC has one VFC. You can get the address and contact number of your VFC here. Remember, even though there are new wards now, your VFC will remain the same since your AC has not changed. Submit the Form 6 at the VFC with copies of address proof/ID proof. The VFC officials will check if your form has been filled in correctly and then give you an acknowledgment receipt. 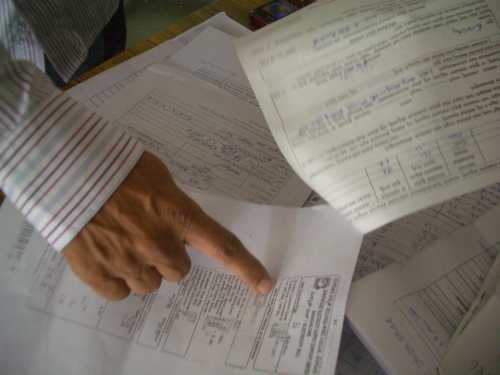 These forms are then sent to the concerned Revenue Inspector (RI) of that Ward. It is usually sent to him two days after the date of submission. Submit Form 6 at your VFC with copies of address and age proof. Pic: Vaishnavi Vittal. Revenue Inspector/Assessor will make a house visit to verify the applicant’s address. Pic: Vaishnavi Vittal. The applicant’s details will then be entered into the manuscript. Pic: Vaishnavi Vittal. The manuscript will include serial number, full name, father’s or spouse’s name, age and gender. Pic: Vaishnavi Vittal. VFC officials will enter these details onto the computer. Pic: Vaishnavi Vittal. Your photograph will be taken for the EPIC. Pic: Vaishnavi Vittal. Your EPIC is generated and you are all set to vote! Pic: Vaishnavi Vittal. The next step at the ward level is usually divided between two officials of that ward – the RI and the Assessor. Either of these officials will first check if the form comes under their jurisdiction. They will refer to the ward map for the same. New maps have been given to these officials to account for redestricted and expanded 198 wards of Bangalore. Then will check if the form has been filled in correctly, if the necessary documents have been attached, signature, age and previous place of residence (if any). In case of the address proof if a lease agreement is attached, the copy will be checked more thoroughly since there is a scope to enclose fake documents. In case of any discrepancy the official will telephone the applicant and check with him/her, say these officers. This is followed by a house visit to ensure that the applicant resides in the stated place of residence. The RI/Assessor will either do this check alone or will be accompanied by a Tax Inspector. If the applicant are not at home at the time, the official will speak to the family members or even neighbours to ensure that the information stated in the form is true and that the applicant has been residing there for at least six months (as per law). The officer will make a maximum of two visits. Once this is checked, the RI/Assessor will enter the applicant’s details in the manuscript. This will include the serial number, full name, father’s or spouse’s name, age and gender. The manuscripts of all the wards of a particular AC are collected and the VFC officials enter the details on to the computer. This entire process takes about 15 days. At the time of submitting your Form 6, you will be asked to come back after 15-20 days. Here is the complete list of candidates for BBMP election 2015, extracted from form 7 and compiled by Citizen Matters. A good article written in a lucid article. I like slide show with the set of procedures to follow. Thank you for such a useful information. This is a good set of information. I was not aware of this at all. Thank you!